The critter-filled true story of the show! Follow Steve across six continents in his crazy quest to find the world’s most lethal living creatures. In this highly personal diary, TV wildlife expert Steve shares what it means to him to film the world’s greatest predators. Learn how it feels to have a blue whale silently power past you in crystal clear Indian Ocean waters. Or to dangle from a helicopter and be dropped in a crocodile nest – while the mother crocodile is still there! Giving you an intimate view of the experiences that shaped the smash-hit BBCDeadly 60 series, this book includes colour photos, true facts and a personal journal of Steve’s own thoughts. IT IS AWESOME! 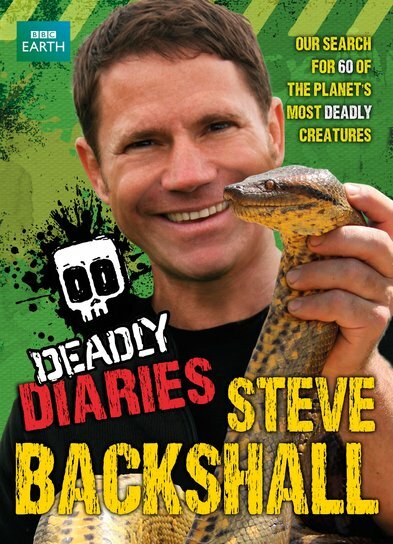 CHECK OUT STEVE BACKSHALL’S AUTOGRAPH AT THE BACK AND CBBC PROGRAMME! SORRY IF I GOT THE SPELLINGS WRONG, IM TOO EXCITED!